It has been sleeting for most of the day and we currently have over 3 inches of sleet on the ground. The streets are a mess and the airport is closed. This is just round one...round two is supposed to start at about 2:00am and will consist of 5 or more inches of snow. I've scheduled another vacation day for tomorrow as I know that my Miata doesn't stand a chance of being able to make it through this mess. Since I couldn't go anywhere today because of the sleet, I stayed inside and stamped. I worked on another Artist Trading Card for a new swap that I joined. 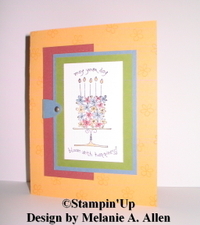 This particular swap is for the various Stampin' Up color families. I joined the Bold Bright swap and my color is Lovely Lilac. The idea is to use the assigned color along with all of the coordinating colors. I chose the Be Happy stamp set since that is one of my newest sets and I haven't really had a chance to use it much yet. To keep the size in perspective, artist trading cards are only 2.5 by 3.5 inches. I played around with the design for what seemed like forever until it finally came together. This swap is for 12 cards but I always make an extra one to keep. Once I had finalized the design, the other 12 cards went pretty quickly. I'm really pleased with the result. Never mind that it was 70 degrees again today, the first winter storm of the season is on its way. The National Weather Service has changed the Winter Storm Watch to a Winter Storm Warning which basically means that the "weather experts" are pretty certain that the storm is going to materialize. It's raining right now and will start freezing late tomorrow morning with up to an inch of ice expected. The freezing rain will then change to snow and dump 3 to 12 inches on the St. Louis area. Lucky us! I scheduled a vacation day for tomorrow. I'm planning to wrap Christmas presents and work on some cards and crafts. I may have to schedule a vacation day for Friday too depending on how much snow we end up getting. I'm sure all of the kids in the area are hoping for a snow day or two. I keep a running list of "future blog entries." It's basically a list of thing I eventually want to post on my blog. One of the items on my list is favorite movies. After a recent conversation with a friend regarding Steel Magnolias (we both can quote lines from the movie word for word - you're too twisted for color TV) I decided to post a list of my favorite movies. I can watch these movies over and over. In fact, I have watched each of these movies at least 10 times each. Stay tuned for future Top 10 listings...music, TV movies, TV shows, albums, books, etc. and it isn't Santa and eight tiny reindeer (nine if you count Rudolph). 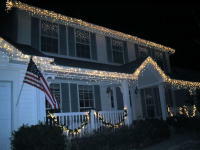 Since the weather was so nice today (65 degrees), Bill decided to put up the Christmas lights. 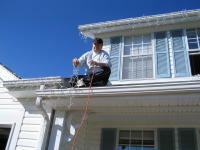 That involves walking on the roof of our two-story house! My mom hates the thought of Bill on the roof so I took these pictures especially for her! Hee hee hee... Usually the weather is quite chilly this time of year so it was a nice change of pace to be able to be outside without coats and gloves. We actually turned off the heat and opened the windows! My job consists of supervising the installation of the lights to make sure that there is a sufficient number of electrical outlets. According to Bill, I'm the electrical engineer and he is the lineman...I guess that means I'm the boss; no surprise there! I sit in the big chair (and don't you forget it). I've been working on Christmas cards and crafts for the past few days in my spare time. The cards were 90% finished quite some time ago as I hate waiting until the last minute. In fact, I started designing them in January! Anyway, I just have to tie a few more ribbons and attach them to the cards and then they're ready to be signed and mailed (the envelopes are already addressed). As for the Christmas crafts, I've been using the new Cricut cartridge and I'll post a picture of one of my creations in the next few days. I created a Thanksgiving card for family and a few friends. I got the idea from a card I saw in a stamping magazine. The creator of that card, however, used patterned paper. Since I'm not a scrapbooker, I don't really use any patterned paper, only card stock. I decided to use three shades of brown cards stock. 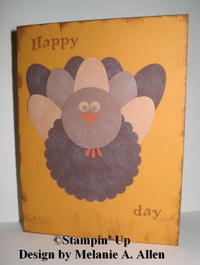 The turkey is created using Stampin' Up punches and the Marvy Uchida scalloped circle punch. He looks like one crazy turkey! I bottled my Pumpkin Ale on Sunday. It is now sitting in the carbonation room (aka office room) and will remain there for two weeks. I should have brewed it a few weeks earlier so that it would have been ready by Thanksgiving. One more day of work and then a four day weekend...yippee! make me happy! I went to Michael's this morning to get a few things for some Christmas crafts I'm making. I found everything I needed and then I noticed that the Cricut cartridges were on sale. They're normally $90 but Michael's had them on sale for $50! I've been wanting to get the Bags, Tags, Boxes & More cartridge so I just couldn't pass it up. I bought it and then immediately called my sister because there are a few cartridges that she's interested in too. After Michael's, I went to Macy's to buy a few Cardinals tee-shirts for a fellow stamper. She lives in California and wants to buy World Series shirts for her fiance who is a Cardinal fan but she has been unable to find any shirts anywhere. I chose two different shirts and then noticed that there were sweatshirts too! When we bought shirts the day after the Cardinals won the World Series, I wanted a sweatshirt too but they didn't have any available yet. I bought a red hoodie with the Cardinal logo and the phrase "Rulers of the Roost - World Series Champions." Too cute! I then went to Dierberg's to get a few things for dinner. I stopped by the olive bar and guess what I saw...blue cheese stuffed olives. When we're in Las Vegas, we always eat at Red Square and have at least one of the Red Square Martini's which includes two blue cheese stuffed olives. In fact, I think that's the main reason I drink that particular martini...hee hee hee. A new Cricut cartridge, a Cardinal sweatshirt and blue cheese olives. Like I said, little things make me happy! I have been busy working on quite a few card designs lately. Unfortunately, I can't post any of them for at least two or three weeks. I want to make sure the recipients receive them before I post a picture here. I made this card about three months ago and never posted it. It was an "end of summer" creation. The stamp set is called More Than a Memory and it is one of my favorite new stamps sets (I think I say that about ALL of the stamp sets I buy). 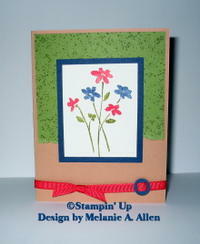 I decided that red and navy flowers would be cute along with olive colored stems and background. I then mounted the focal image and partial background on carmel card stock and added a ribbon and a round card stock buckle. It's simple but I really like how it turned out. Believe it or not, there is no sparkle on this card. I'm making up for it with my latest creations...hee hee hee. Just a reminder...a few weeks ago, I added a link which allows you to sign up to receive an e-mail each time my blog is updated. If you choose to sign up, your e-mail address will not be used for any other purposes and you can unsubscribe at any time. 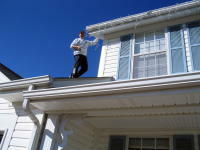 The link is located on the right side below the copyright information. A big thanks to my loyal readers! I went to the Stampin' Up Regional Seminar yesterday at America's Center here in St. Louis. It was so much fun! It was a day of stamping, talking about stamping, learning about stamping, etc. What could be better than that! They presented new ideas and techniques, we made 6 different projects and we received a brand new stamp set called Double Line Doodles which won't even be available to the general public until next July. Many of the attendees make cards to swap with each other. Since I only stamp as a hobby and not as a business, I don't need a ton of samples so I didn't take part in the swap. 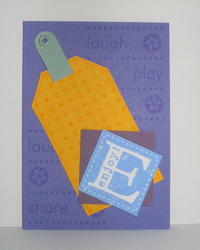 I did, however, bring one card to submit to Stampin' Up for possible posting on their website. The main image and words come from the Blooming With Happiness set and the background stamp is the small flower from the Simply Said set. I used three of the new colors (Cranberry Crisp, Marigold Morning and Buckaroo Blue) along with Old Olive. I used the large oval punch and folded it in half to create the tab on the left. I secured it with a antique gold brad. Since I love sparkle, I decided to add Dazzling Diamonds to the flames on the candles. Be sure to click on the photo for a larger view. I rode to the seminar with my SU up-line, Amber. After the seminar, I walked two blocks to Kitchen K to meet Bill for dinner. It has been on our list of restaurants to try for quite some time. I had a cup of the chicken gumbo which was wonderful. For dinner, I had the blackened chicken penne with spinach, andouille and sun-dried tomato cream. I absolutely loved it. We don't often eat dessert, usually because I'm much too full by the end of the meal, however, the flourless chocolate cake just looked too good to pass up. We really enjoyed the dinner and will definitely visit Kitchen K again. Stamping and great food...a wonderful day!